Mumps is a contagious viral infection that used to be common in children before the introduction of the MMR vaccine. 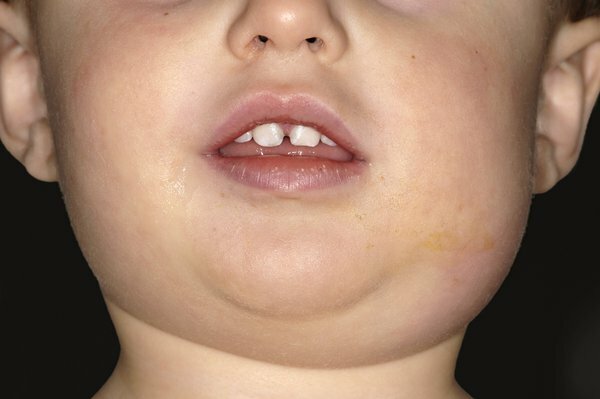 It's most recognisable by the painful swellings at the side of the face under the ears (the parotid glands), giving a person with mumps a distinctive "hamster face" appearance. Other symptoms of mumps include headaches, joint pain and a high temperature, which may develop a few days before the swelling of the parotid glands. It's important to contact your GP if you suspect mumps so a diagnosis can be made. While mumps isn't usually serious, the condition has similar symptoms to more serious types of infection, such as glandular fever and tonsillitis. Your GP can usually make a diagnosis after seeing and feeling the swelling, looking at the position of the tonsils in the mouth and checking the person's temperature to see if it's higher than normal. Let your GP know in advance if you're coming to the surgery, so they can take any necessary precautions to prevent the spread of infection. If your GP suspects mumps, they should notify your local health protection team (HPT). The HPT will arrange for a sample of saliva to be tested to confirm or rule out the diagnosis. During this time, it's important to prevent the infection spreading to others, particularly teenagers and young adults who haven't been vaccinated. You can protect your child against mumps by making sure they're given the combined MMR vaccine (for mumps, measles and rubella). The MMR vaccine is part of the routine NHS childhood immunisation schedule. Your child should be given 1 dose when they are around 12-13 months and a second booster dose at 3 years and 4 months. Once both doses are given, the vaccine provides 95% protection against mumps. There's currently no cure for mumps, but the infection should pass within 1 or 2 weeks. Read more about treating mumps. Mumps usually passes without causing serious damage to a person's health. Serious complications are rare. However, mumps can lead to viral meningitis if the virus moves into the outer layer of the brain. Other complications include swelling of the testicles or ovaries (if the affected person has gone through puberty). Read more about the complications of mumps. Most cases of mumps occur in young adults (usually born between 1980 and 1990) who didn't receive the MMR vaccine as part of their childhood vaccination schedule or didn't have mumps as a child. Once you've been infected by the mumps virus, you normally develop a life-long immunity to further infection.